Mardi Gras, America – Carol M. Highsmith’s America, Library of Congress, Prints and Photographs Division. From Mardi Gras and exploring the historic French Quarter to cocktail themed tours there is something for everyone in New Orleans, a place where centuries old architecture is the backdrop for all ventures. Here are 10 reasons why visitors should visit in 2017. Celebration is at the core of the New Orleans’ experience, and to get a true taste of the city, every visitor should join in one of these unforgettable festivals. 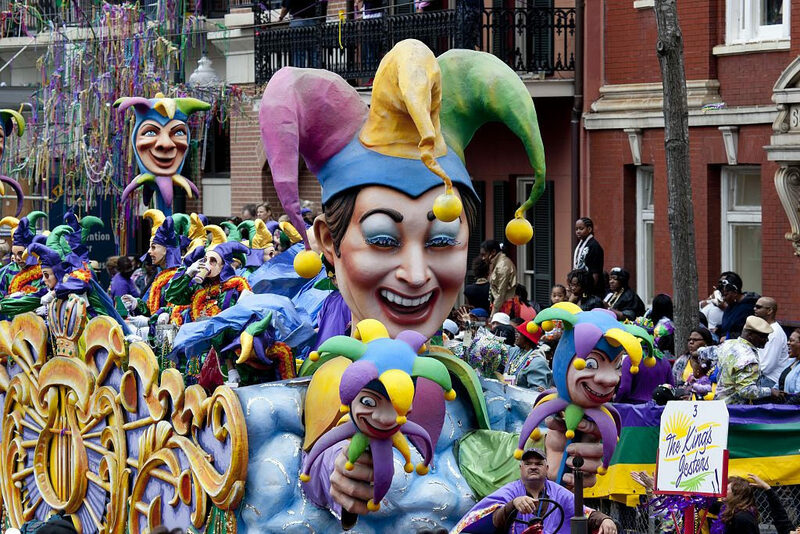 Whether it is music, food or the arts one loves (or all of the above), they’ll want to join in as New Orleans lets its hair down and declares, “laissez les bons temps rouler!” (let the good times roll). Visit this page for a calendar of events. Many of these are free – French Quarter Fest, Satchmo SummerFest, Po-Boy Preservation Festival, Wednesdays at the Square and, and of course, Mardi Gras. New Orleans offers a plethora of free activities to choose from. Walk among the centuries-old oaks of City Park, picnic in the picturesque Audubon Park or enjoy views of the Mississippi River at Woldenberg Park. Stroll along Bourbon Street, Frenchmen Street and Fulton, where jazz pours out onto the street, or duck into a club for the full experience. Many clubs don’t even charge a cover. Explore New Orleans neighbourhoods and their connection to jazz with six self-guided Jazz History Walking Tours. Click here for a list of free things to do in New Orleans. New Orleans has been selected to host NBA All-Star 2017. The 66th NBA All-Star Game will be played on Sunday 19th February, at Smoothie King Center – home of the New Orleans Pelicans. This will mark the third time New Orleans has been the site of the league’s annual midseason celebration, having previously hosted the event in 2008 and 2014. In New Orleans, a great drink is just as important as a great meal. New Orleans’ signature drinks are almost as famous as the nightlife bars and hot spots that make them, check out this list for a list of New Orleans cocktails and where to enjoy a Sazerac, Hurricane or French 75. There are cocktail walking tours which tell you the history of the city whilst you taste some of these classics and you can even bring your drink from one bar to the next in a “cup to go”. Beer enthusiasts should not miss the 8th annual NOLA on Tap Beer Fest. The one-day event, taking place in New Orleans City Park in September is the largest event of its kind in the region and allows beer aficionados to sample more than 400 local, regional and nationally homebrewed and microbrewery beers. From food, culture to music, New Orleans has a museum for every scholar at every age. Learn about the cuisine of South East Louisiana at the Southern Food & Beverage Museum, celebrate fine arts at New Orleans Museum of Art, ride a hummer during the WWII Museum Victory Theatre’s 4D cinematic experience and discover where Mardi Gras is made at Blaine Kern’s Mardi Gras World, the largest float-building warehouse in the world. For a comprehensive list of museums please visit this page. Visit this page for a 3 days itinerary of New Orleans. For more information, please visit www.neworleanscvb.com, @NewOrleansCVB on Twitter, ‘like’ on Visit New Orleans Facebook and follow us on Instagram (VisitNewOrleans). Or visit www.louisianatravel.com, @louisianatravel on Twitter. New Orleans is great…but be advised that the weather is going to be HOT & HUMID from June to October. Best months to visit are March and October. I lived there two years.